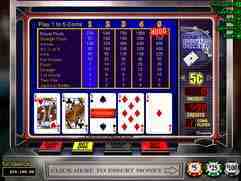 RTG Double Bonus is a variation of video poker that offers different payments for the different types of four-of-a-kind. On full coin, four-of-a-kind Aces will bring home a big bonus of 800 coins. The extra payouts make Double Bonus a better game for players since it has a lower house edge than traditional versions of video poker. RTG Double Bonus also gives an incentive to play full coin with the payout for the Royal Flush increased to 800 to 1 on full coin compared to just 250 to 1 when playing 1 to 4 coins. Mathematically this is more than a 1.5% difference in house edge. So always play full coin on RTG Double Bonus. You can play Double Bonus at any of our recommended RTG online Casinos. It’s also worth trying out their multi-hand draw, where you can play draw at the same time over 100 times. This means you can hit your big draws more often and win the big one more! If you’re looking for a fun place to play RTG Double Bonus Video Poker, we’d like to suggest trying out Silver Oak Casino. Silver Oak Casino is a reputable online casino that has just about every video poker game you can think of; including Double Bonus Video Poker! We enjoy playing video poker games at Silver Oak because they have some of the fastest payouts in the industry, which means you can get your winnings in a matter of hours! So, if you’re interested in learning more, simply visit the Silver Oak Casino website today! Another great place to play RTG Double Bonus Video Poker is at Slots Plus Casino. This reputable online casino has hundreds of games to choose from; including slots, blackjack, and plenty of video poker games like Double Bonus Video Poker! They also have a terrific signup bonus that you don’t want to pass up! Right now; all new players who make their first deposit can get a 400% bonus worth up to $3,000 in free casino money at Slots Plus Casino! Vegas Casino Online is an RTG powered online casino that has one of the best video poker bonuses available online! For a limited time, you can get a 400% bonus on your first deposit worth up to $3,000 in free video poker money! You can use this free money to play Double Bonus Video Poker or any other game that you’d like! Take advantage of this hot online video poker bonus today before it’s too late by visiting the Vegas Casino Online website! If you’re looking for a new place to play RTG Double Bonus video poker, we highly recommend Manhattan Slots Casino. This is one of the newest RTG powered online casinos, but they have already made a name for themselves as an honest and USA friendly online casino. At the moment, to help celebrate their recent launch, they are giving our website visitors an exclusive $25 free casino money bonus when you redeem the bonus code 25CBG! This is a great opportunity to try out RTG Double Bonus video poker for free, but this bonus won’t last long, so head over to Manhattan Slots Casino today to take advantage of this great offer! Aladdin's Gold Casino is an established and respected RTG powered online casino that accepts players from around the world; including USA players! At the moment, they are offering our website visitors a free $25 bonus with no deposit required! All you need to do is redeem the bonus code 25CBG in the coupon section of the cashier and your account will instantly be credited with this free bonus! You can use your bonus money to play RTG Double Bonus video poker or any of the other great games available at Aladdin's Gold Casino! If you’re in search of the best casino bonuses for RTG Double Bonus video poker, you’ve come to the right place! We are pleased to introduce to you Aladdin's Gold Casino; a reputable RTG powered online casino that is currently offering our website visitors two exclusive bonuses that you won’t find anywhere else! For starters, you can get $25 in free casino money when you redeem the bonus code 25CBG. Then, when you’re ready to play for real money, you can get up $8,000 in free casino money when you make your first deposit at Aladdin's Gold Casino! Planet7 Casino is a well known RTG powered online casino that caters to players from around the world; including USA casino players. They have hundreds of great games to choose from; including slots, table games, and video poker games like RTG Double Bonus video poker! Right now; all new players can get $25 in free casino money by redeeming the bonus code 25CBG! In addition to this great bonus, when you go on to make your first deposit, you’ll be eligible for up to $5,000 in free casino money bonuses at Planet7 Casino! If there’s one casino that you can trust more than any other, it has to be iNetBet Casino. iNetBet is one of the oldest and most respected online casinos; having been online for more than a decade! At the moment, you can try out this reputable online casino for free by redeeming our special bonus code CBG10. This will give you a $10 free casino money bonus with no deposit required that you can use to play RTG Double Bonus video poker or any of the other great games that are available at iNetBet Casino! Slots Plus Casino is an RTG powered online casino that is currently offering one of the biggest RTG casino bonuses you can find! For a limited time, all new players who make their first deposit will be eligible to receive a fantastic 400% match bonus worth up to $4,000 in free casino money! This free bonus money can be used to play RTG Double Bonus video poker or any of their other great games, so Head over to Slots Plus Casino today to claim your free bonus and get in on the action! Aladdin’s Gold Casino is an RTG powered online casino that is offering new players an UNLIMITED number of bonuses during their first 7-days as a new player! You read that right; you can get an unlimited number of bonuses with no maximums on each and every purchase you make during your first week as a new player! You can use this bonus money to play RTG Double Bonus video poker or any of the other great games at Aladdin’s Gold Casino!